Cuisinart, online at cuisinartwebstore.com, is the official store for you to find all the kitchen tools and equipment you need. Cuisinart is well known for its fabulous products among which are blenders, bakeware, grills, food processors, electric knives, hand mixers, steamers, toasters and much more. Cuisinart even offers parts and accessories, and kitchen gadgerts that make wonderful gifts. Cuisinart is committed to providing its customers with top of the line kitchen equipment. 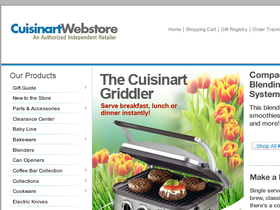 So checkout the Cuisinart Webstore. But first stop by RetailSteal.com to find Cuisinart coupon codes, Cuisinart promotions, and Cuisinart discounts. Shipping rates on Cuisinart orders vary depending on the order purchase and the destination. Standard shipping, 2nd Day Air, and Next Day Air are all available shipping methods. Cuisinart ships to the contintental US, as well as Alaska, Puerto Rico, VIrgin Islands, Guam and Hawaii. See website for full details, exclusions may apply. Visit the clearance center on CuisinartWebstore.com and save over 25% on select appliances. Click link to shop. Get up to $30 cash back at the Cuisinart Rebate Center. Click this link to check it out. Get the Griddler online at CuisinartWebstore.com for $99.95. Click link to shop now. Get an Ice Cream Maker for $59.95 when shopping online at CuisinartWebstore.com. Click link to save. Save 15% on purchases of $175 or more from Cuisinart online today when you use our coupon code online.